The 4 biggest secrets to success are in this post. They will work for you if you use them. They have been used by all successful people. The power to be successful is within all of us, you can sit and cry in your beer or you can follow the proven secrets to success and live your dreams. A great motivator once said that what you believe, you can achieve. It isn’t always easy to believe in yourself and stay positive, especially if you haven’t been successful in the past. This is by far the #1 secret of success since it is not easy to stay positive, and often is very difficult. Don’t let a failure get you down, we all have them, it is just a way of learning what not to do. The greatest book on positive mental attitude and success was written many years ago and has been read by more successful people than all others. It is “Think and Grow Rich”. I was given a copy by an associate in my first business venture, and it changed my life. I would be happy to give you a free copy of this book. Enter your email on the top right and you will receive this book and our special report automatically within minutes. Read this book NOW if you want to be more successful in life. Something very important for keeping that positive mental attitude is knowing what you want. Something like, I want a million dollars, is way too broad. You need to crystallize your thinking and come up with a clear precise plan to achieve it. Your goal and plan must be so clear that you can see yourself having achieved it already. This blog will give you lots of ideas about making an extra few hundred a month or a few thousand a month. What have you been dreaming about, a new car, house, vacation, boat, being your own boss? It is not enough to say a lot of money. What is it you really want. What have you always dreamed of having. It has to be something you feel strongly enough about to turn it into a non stop desire. Once you know what you want, see yourself having already achieved the goal. Visualize yourself in that new house with that kitchen you always wanted, the one with the double stainless convection oven, Viking gas range and built-in sub zero refrigerator. Or see yourself driving your new corvette, the one in bright blue metallic with the Caribbean blue fade on the scoops, with the top down and your hair blowing in the breeze. Dreaming about a house or car, or being your own boss, is not the same as making it a goal. It is not a real goal unless you turn it into a non stop desire. A non stop desire is something that you are obsessed with obtaining. You will now be able to work at your new business plan with enthusiasm because you are on your way of achieving your goals. The desire to build your business and achieve your goal should be so strong that you are always positive throughout the ups and downs. You have a plan, follow it. Believe you can do it, and you will do it, and never let negative thought in your mind. This comes right from “Think and Grow Rich”. I live by this, I know it works. Years ago my first big goal was to move to Florida and buy a house with a swimming pool. How I did that is a story for another day. Second goal was a bigger house on the water, third was a boat, and fourth was a bigger boat. A Euro styled aft cabin Express. 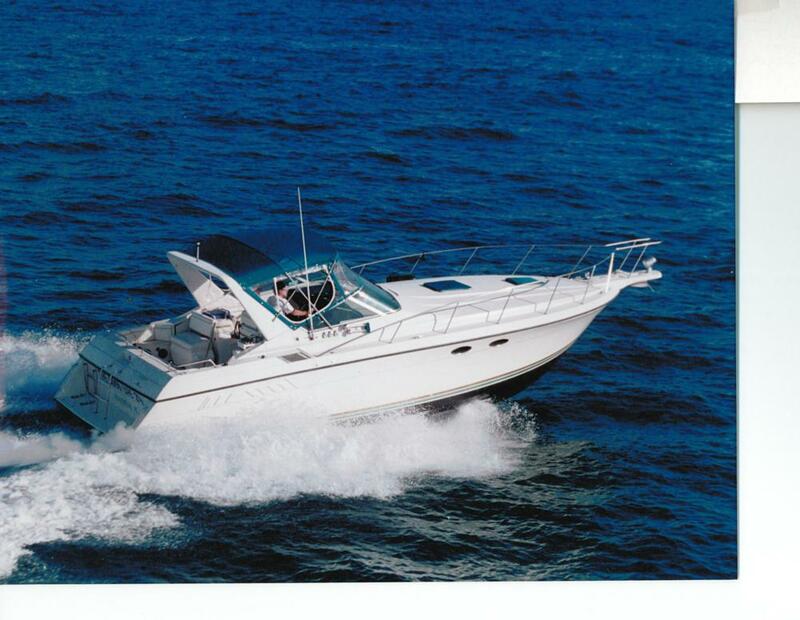 If you are not familiar with boats, that is a really nice cabin cruiser. I had a picture of the exact boat I wanted, in the colors I wanted, taped to the wall in my office. I would dream about how great it would be to have that boat and all the wonderful times I would share with my family and friends on that boat. My wife and I would go to the boat show, stand at the helm of that boat and imagine flying across the ocean in the sunlight headed on vacation in the Florida Keys. Nice boats are very, very expensive. Even with all the success I had, people still laughed at me and my big dreams. But I didn’t care, I always maintained a positive mental attitude and a plan to achieve my dreams. I had a non stop desire to own that boat, I was enthusiastic about my business plan, and I never give up. I never give up. After I got the boat I hired a photographer in a helicopter to take a picture of my wife and I living our dream. I wanted a picture of us on that boat flying across the ocean in the sunlight, headed for a vacation and an adventure. I have that picture hanging behind my desk in my office and another on the wall at home. It the featured picture for this post. That is my wife and I aboard “The Good Life”. I am not smarter than you, and I am not luckier than you. I turn my dreams into goals, make a plan, and I believe. I believe I can do it, and I know you can too. Work on your goals, formulate your plan. See you in Key West.